Since the first gap junction protein (connexin) was cloned over a decade ago, more than a dozen connexin genes have been cloned. Consequently, a wealth of information on the molecular basis of gap junctional communication has been accumulated. This book pays tribute to this exciting era in the history of cell communication research by documenting the great strides made in this field as a result of the merging of biophysics and molecular biology, two of the most powerful approaches to studying the molecular basis of membrane channel behavior. 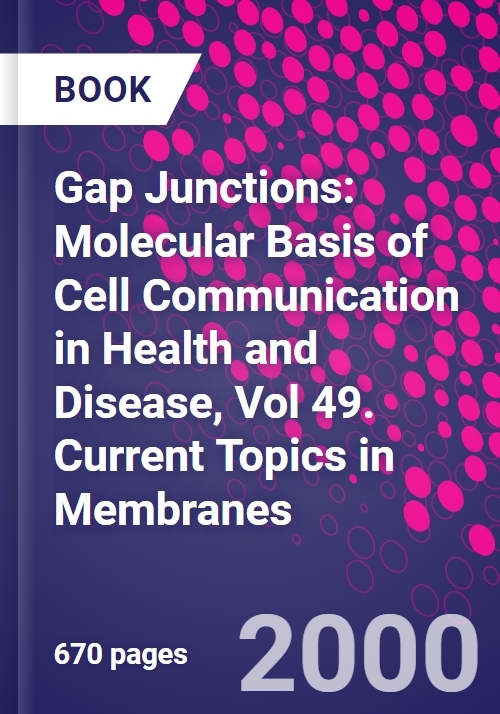 Twenty-eight comprehensive chapters, authored by internationally recognized leaders in the field, discuss the biophysical, physiological, and molecular characteristics of cell-to-cell communication via gap junctions. Key aspects of molecular structure, formation, gating, conductance, and permeability of vertebrate and invertebrate gap junction channels are highlighted. In addition, a number of chapters focus on recent discoveries that implicate connexin mutations and alterations of gap junctional communication in the pathogenesis of several diseases, including the X-linked Charcot-Marie-Tooth demyelinating disease, some forms of inherited sensorineural deafness, malignant transformation, cardiac malformations and arrhythmia, eye lens cataract, and Chagas disease. Gap Junction Structure: New Structures and New Insights, G. Sosinsky. Degradation of Gap Junctions and Connnexins, J.G. Laing and E.C. Beyer. Homotypic, Heterotypic, and Heteromeric Gap Junction Channels, P.R. Brink, V. Valiunas, and G.J. Christ. Heteromultimeric Gap Junction Channels and Cardiac Disease, S. Elenes and A.P. Moreno. Ion Permeation through Connexin Gap Junction Channels: Effects on Conductance and Selectivity, R.D. Veenstra. Phosphorylation of Connexins: Consequences for Permeability, Conductance, and Kinetics of Gap Junction Channels, H.J. Jongsma, H.V.M. van Rijen, B.R. Kwak, and M. Chanson. Intercellular Calcium Wave Communication via Gap Junction-Dependent and -Independent Mechanisms, E. Scemes, S.O. Suadicani, and D.C. Spray. Membrane Potential Dependence of Gap Junctions in Vertebrates, L.C. Barrio, A. Revilla, J.M. Goméz-Hernandez, M. de Miguel, and G. González..
A Reexamination of Calcium Effects on Gap Junctions in Heart Myocytes, B. Delage and J. Délèze. Distinct Behaviors of Chemical- and Voltage-Sensitive Gates of Gap Junction Channel, F.F. Bukauskas and C. Peracchia. A Molecular Model for the Chemical Regulation of Connexin43 Channels: The "Ball-and-Chain" Hypothesis, M. Delmar, K. Stergiopoulos, Nobuo Homma, G. Calero, G. Morley, J.F. Ek-Vitorin, and S.M. Taffet. Mechanistic Differences between Chemical and Electrical Gating of Gap Junctions, I.M. Skerrett, J.F. Smith, and B.J. Nicholson. Behavior of Chemical- and Slow Voltage-Sensitive Gates of Connexin Channels: the "Cork" Gating Hypothesis, C. Peracchia, X.G. Wang, and L.L. Peracchia. Molecular Determinants of Voltage Gating of Gap Junctions Formed by Connexin32 and 26, T.A. Bargiello, S. Oh, Y. Ri, P.E. Purnick, and V.K. Verselis. Regulation of Connexin43 by Tyrosine Protein Kinases, A.F. Lau, B. Warn-Cramer, and R. Lin. Gating of Gap Junction Channels and Hemichannels in the Lens: A Role in Cataract?, R. Eckert, P. Donaldson, J. Lin, J. Bond, C. Green, R. Merriman-Smith, M. Tunstall, and J. Kistler. Biophysical Properties of Hemi-Gap-Junctional Channels Expressed in XenopusOocytes, L. Ebihara and J. Pal. Properties of Connexin50 Hemichannels Expressed in Xenopus laevisOocytes, S. Eskandari and G.A. Zampighi. Gap Junction Communication in Invertebrates: The Innexin Gene Family, P. Phelan. Hereditary Human Diseases Caused by Connexin Mutations, M.V.L. Bennett and C.K. Abrams. Trafficking and Targeting of Connexin32 Mutations to Gap Junctions in Charcot-Marie-Tooth X-Linked Disease, P.E.M. Martin and W.H. Evans. Molecular Basis of Deafness Due to Mutations in the Connexin26 Gene (GJB2), X. Estivill and R. Rabionet. "Negative: Physiology: What Connexin-Deficient Mice Reveal about the Functional Roles of Individual Gap Junction Proteins, D.C. Spray, T. Kojima, E. Scemes, S.O. Suadicani, Y. Gao, S. Zhao, and A. Fort. Role of Gap Junctions in Cellular Growth Control and Neoplasia: Evidence and Mechanisms, R.J. Ruch. Gap Junctions in Inflammatory Responses: Connexins, Regulation, and Possible Functional Roles, J.C. Sáez, roberto Araya, M.C. Branes, M. Concha, J.E. Contreras, E.A. Eugenín, A.D. Martínez, F. Palisson, and M.A. Sepúlveda. Cx43 (a<->1) Gap Junctions in Cardiac Development and Disease, R.G. Gourdie and C.W. Lo. Gap Junctional Communication in the Failing Heart, W.C. De Mello. Gap Junctions Are Specifically Disrupted by Trypanosoma cruzi Infection, R.C.S. Goldenberg, A. Gonçalves, and A.C. Campos de Carvalho.